Eggplant is definitely one of my favorite vegetables but I am particular on how they are prepared. Although most restaurants and delis pride themselves in offering eggplant sandwich on their menus, often times I find how they have prepared them isn’t pleasing to my seasoned pallete. I think the key to serving a successful eggplant dish or sandwich is slicing them thin enough to cook or roast properly and so they absorb the flavor they are often times soaked in. Preheat an oven to 450. Prepare a baking sheet with a layer of parchment paper or foil. Toss the eggplant, onion, olive oil and salt together in a large bowl. Spread the coated veggies on the prepared baking sheet in 1 layer. Shake the pan to make sure the vegetables lie flat and have the maximum possible surface area exposed. Roast in the oven for about 20 minutes, or until the veggies become soft and fragrant. With a spatula, flip the vegetables so that they brown on the opposite side. Return the baking sheet to the oven for another 10-20 minutes or until the vegetables are caramelized and browned. Transfer the caramelized vegetables to a large bowl and toss with the lemon juice and chives until thoroughly coated. Lay 6 slices of bread on a work surface. Divide the eggplant among the slices. 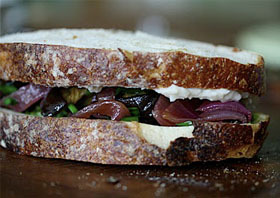 Slather the remaining bread with the rosemary cannellini bean spread, if using, and close the sandwiches.